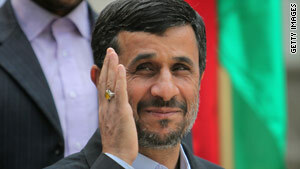 Iranian President Mahmoud Ahmadinejad said new sanctions could bring an end to negotiations with the West. Iranian president warns against "language of force and aggression"
New York (CNN) -- Diplomats hoping to slap tougher sanctions on Iran because of its nuclear program will vote on a new draft resolution on Wednesday. The United Nations Security Council resolution -- which could change before it comes to a vote -- would put restrictions on Iranian entities and individuals, including members of the Revolutionary Guard Corps. CNN obtained a copy of the circulating draft from a Western diplomat. A closed-door meeting was scheduled for later Wednesday to give Brazil and Turkey a chance to air their views on a nuclear fuel swap, said Mexican Ambassador Claude Heller, the current Security Council president. Turkish and Brazilian leaders traveled to Tehran in May to broker a deal that was dismissed by the United States as inadequate. The United States faces significant opposition from Turkey and Brazil. The deadly raid by Israeli forces on a flotilla of civilian ships hoping to provide aid to Palestinians in Gaza has complicated matters, especially with Turkey, which had significant numbers of its citizens aboard the flotilla. Video: New sanctions against Iran? The resolution needs nine votes in favor to pass, unless one of the five permanent members of the 15-nation Security Council vetoes it, which is not expected. Iranian President Mahmoud Ahmadinejad lashed out Tuesday by saying Iran would cease negotiations with the West over its nuclear program if any new sanctions are adopted against his nation. By calling for a resolution instead of sitting down for talks with Iran, the United States is "gravely mistaken," Ahmadinejad said. "Within the framework of respect and justice, we're ready to negotiate with everyone. Anyone who is going to resort to the language of force and aggression, the response is clear." The draft resolution restates the Security Council's demand that Tehran suspend enrichment activities and other proliferation-sensitive nuclear activities. It requires Tehran to cooperate fully with the watchdog International Atomic Energy Agency. Among other restrictions the sanctions would impose are an expanded arms embargo; a freeze on assets and a ban on travel of 40 entities and one individual; and a requirement that nations prohibit Iranian investment in foreign commercial activities capable of delivering nuclear weapons. Fifteen of the 40 entities are "owned, controlled or acting on behalf of the Islamic Revolutionary Guard Corps," three are controlled by the Islamic Republic of Iran Shipping Lines, and the remaining 22 are linked to Iran's nuclear and ballistic missile programs, two senior U.S. officials said. Officials say the individual subject to the travel ban is Javad Rahiqi, head of the Isfahan nuclear plant. Another 35 people who were slapped with travel restrictions have been upgraded to full travel bans, the officials said.